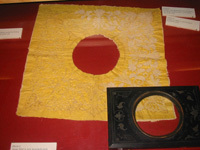 Kenmare Lace is a needlepoint lace. It is made with a needle and thread. At the back are two pieces of cloth. Over that is the design. The design is covered with a layer of green or blue matt contact. These designs are copies of those designs, which were hand painted by the nuns at the Convent of The Poor Clare’s Kenmare over 100 years ago. The four layers are tacked (basted) together. A thread is laid down outlining every part of the design. This thread is called the couching thread. The tiny stitches holding it down are called bridges. The design is filled in using the detached buttonhole stitch. These stitches are worked row upon row in from the couching thread. The size and tension of the stitches determines the pattern. 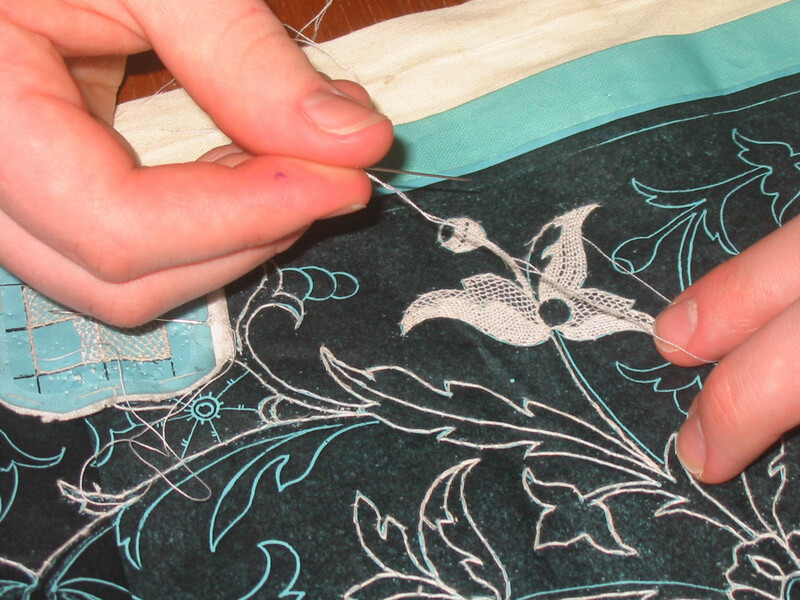 When the whole design has been filled in the lace is ready to be removed from the backing. To do this the tacking is removed. The two backing cloths are opened up until the bridging stitches are visible between them. These stitches are then cut using a stitch ripper or a sharp blade. 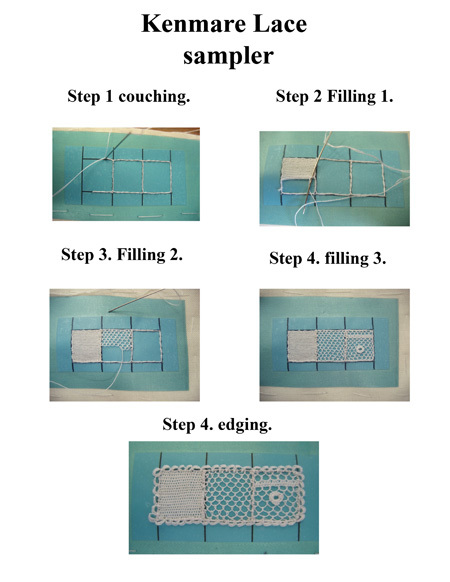 As the bridges are made with a separate thread, which is not part of the lace thread, they can be removed without affecting the lace. 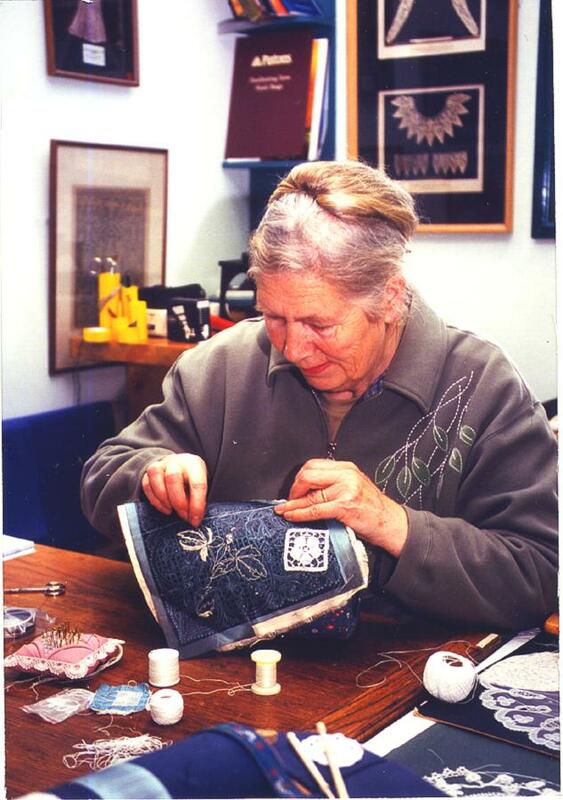 The work can then be lifted off the backing thus revealing the beautiful Kenmare Lace. Above is the beginnings of a large piece of Kenmare Lace. 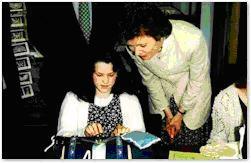 Emer Finnegan making bobbin lace, watched by President Mary Robinson at The Kenmare Lace and Design Centre.